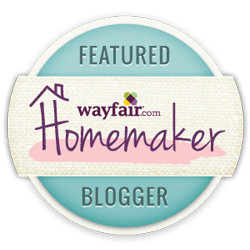 I was just tickled to be invited to share my Summer home tour with you all, along with some amazingly talented other bloggers! A huge “thanks” to Gina from The Shabby Creek Cottage for putting this all together and including me! There’s just something special about adding the ol’ glorious red, white and blue around our home! It signifies Summer to me! I’m not sure what that feeling is, but I love it! I greatly appreciate the ones who have fought for our freedom, the freedom this country still has and the ones who continue to fight for it. It’s so refreshing in a world as crazy as ours, to see those little flags still have so much life! They are cherished in our home all Summer long. Following the entryway is our living room. The living room is where we spend a lot of our time as a family! I keep the room comfy and practical (as much as possible!). My kids know the drill by now and most of my stuff doesn’t get touched by their little fingers anymore! But don’t let that statement fool you… they still run around the house and have fun! My formal dining room is probably one of my very favorite rooms to decorate! It’s directly off the living room. It’s a room that I can sit and enjoy while in the living room! We use it mostly when we have parties, large dinners, holidays, etc. You know me, I love live greenery! But the truth is, it gets expensive buying it all the time! I was excited to find some pretty live looking pieces at a recent trip to Hobby Lobby. All the greenery displayed is faux! And as we go up the stairs, I’ll give you a quick peek into the master bedroom! Complete with a sleeping doodle and all 🙂 Oh, and fresh peonies from the garden! Well that completes my Summer home tour! I will be sharing more with you soon! We are super busy preparing for a local Summer Barn Sale next weekend! I cannot wait to share all the goodies we are making it for it, so stay tuned! Please be sure to visit the other incredible homes in the Summer Tour of Homes!